The cabin was as expected and cleaned very well. But ncl could you please upgrade your pillows, the seemed a bit tough. Nice room big picture window. Only issue is that is is above the theater so you may hear practice or shows if you are in the room then. The air quality was poor. The cabin itself was fine. Lots of storage, big bathroom for a ship. Nicely furnished--obviously redone recently. I liked our cabin. The window was very large, and in general we couldn&apos;t hear our neighbors. There wasn&apos;t any noise from the floor above. We were very close to the elevators, as well as to the restaurants. The cabin was great. A lot bigger than expected. Absolutely spotless. 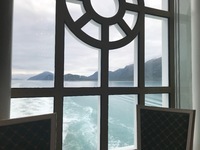 The oceanview picture window was perfect for the children. The beds where comfortable and the space was eficient for our needs.